I am talking about "Oracle Database 11g Performance Tuning Recipes A Problem-Solution Approach" book By Darl Kuhn , Sam Alapati , Bill Padfield. Thank You Jonathan Gennick the chance for me to become technical review this book. This book can not help you to become Oracle Expert (Because, this book was written from the real-world for database administrators in need of immediate help with performance issues relating to Oracle Database). If you work with Oracle Database as Oracle Database Administrator (Beginner to Advanced). You are looking for solutions to common database performance problems or reference book to help with performance issues. I guarantee this book is useful. I used "Beginner to Advanced" word, I don't mean: "If you have worked with Oracle Database a long time. You don't need read this book". Actually You should read it!!! Because This book was written about Oracle Database 11g also, This book will helpful to figure you out for solutions on 11gR1 and 11gR2. If you are Oracle DBA (Newbie). You are asking How to solve database performance issue? You have to read many documents, many concepts. But The database performance issue can not wait... and wait. read some documents or some books what help you immediately. If you are Oracle DBA (Intermediate/Advanced). You had worked on Oracle 8, 9i, 10g ...whatever. In Today, You have to work on Oracle 11g. You have to learn some new features and you may find the new performance issue. This book can figure you out. You can save your time to find out the information to solve the issue. I work on Oracle Database 10gR*, and 11gR*. I have the change to review this Book(good for me). I often see the performance issue on Oracle Database and have the change to use the idea, the command-line and the samples from this book to solve the issue. The "Oracle Database 11g Performance Tuning Recipes A Problem-Solution Approach" book has 15 chapters (related 11gR1 to 11gR2). If you need to know about Table of contents(I will publish later), but I can tell you what you will learn in each of chapter. Chapter 1: Learn to optimize table performance. You have to work with TABLE object and How to optimize it? This chapter was writen about database features that impact the performance of storing and retrieving data within a table. Chapter 2: Learn about Indexes. An index is a database object used primarily to improve the performance of SQL queries. How to use index more efficient? Chapter 3: Learn to optimize Instance Memory. You work as DBA. You have to know about SGA,PGA and ... You work on 10g, You have to know "Oracle Automatic Shared Memory Management". You work on 11g, You have to know "Oracle Automatic Memory Management". This chapter deals with managing and optimizing Oracle's memory. Chapter 4: You are Oracle DBA. You need to monitor system and database performance. You need to know about AWR. You will learn about AWR in this chapter. Chapter 5: Learn to reduce Contention in the Database - You often see Oracle Wait Events, example: "enq: TX - row lock contention". How to reduce them? Chapter 6: Solving database performance issues sometimes requires the use of operating system (OS) utilities. You will learn to use OS utilities (Linux/Unix) for Solving database performance issues. Chapter 9: Learn to manual Tuning SQL. Learn to use Execution Plan and read it. Learn to use SQL Monitoring and what you should know about Tuning SQL by Manual. Chapter 10: Tracing session activity is at the heart of most SQL performance tuning exercises. You will learn from this chapter. 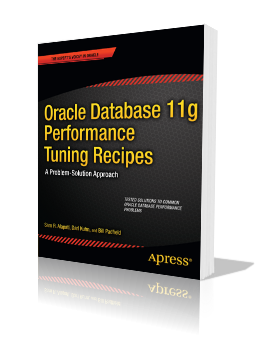 Chapter 11: When you work on Oracle Database 11g, you need to know about Automated SQL tuning features. You will learn about it in this chapter. Chapter 12: Learn about SQL Profie and How to use SQL Plan Baselines. Chapter 13: Learn to use the Optimizer for 11g. Example: set preferences for statistics collection, enable/disable Optimizer Statistics Gathering and etc. Chapter 14: Learn to use Query Hints. Chapter 15: Parallelism can help improve performance, this chapter you will learn about it. You can read book description. Sam R. Alapati is an Oracle ACE and an experienced Oracle database administrator (OCP Oracle Database 11g). Sam is currently the senior technical director for Miro Consulting, Inc., in Woodbridge, New Jersey, and regularly consults with Fortune 500 companies in the areas of Oracle Database, Oracle E-Business, and Oracle Fusion Middleware technology. Sam has written several books on Oracle database management, including Expert Oracle Database 11g Administration, Oracle Database 11g: New Features for DBAs and Developers (with Charles Kim), and RMAN Recipes for Oracle Database 11g (with Darl Kuhn and Arup Nanda), all published by Apress. Sam lives in Dallas, Texas with his wife, Valerie, and children, Nina and Nicholas. Darl Kuhn is a senior database administrator working for Oracle. He handles all facets of database administration from design and development to production support. He also teaches advanced database courses at Regis University in Colorado. Darl does volunteer DBA work for the Rocky Mountain Oracle Users Group. He has a graduate degree from Colorado State University and lives near Spanish Peaks, Colorado with his wife, Heidi, and daughters, Brandi and Lisa. Bill Padfield is an Oracle Certified Professional, working for a large telecommunications company in Denver, Colorado as a lead database administrator. Bill helps administer and manage a large data warehouse environment consisting of more than 75 databases. Bill has been an Oracle Database administrator for more than 14 years, and has been in the IT industry since 1985. Bill also teaches graduate database courses at Regis University and currently resides in Aurora, Colorado with his wife, Oyuna, and son, Evan.